FINALLY BEAT GAMESAGER'S GAUNTLET TIME!!!! Hey all! I beat Gamesager's gauntlet time here a day or two ago. Here it is! His best is 19.8 seconds. Still your time’s pretty impressive. I could shave off probably 2 seconds too, without having the 50 kph right out of the start... which is the next stage for me. CONSTANT IMPROVEMENT! Thanks though. It took a lot of trial and error. I'm sure every TF2 player knows the struggle LOL! You can embed you-tube videos by clicking the share button on you-tube then pasting the share link in the discussion. so I pasted "https: // youtu.be / LpIwuv2dMdI" but remove the spaces and it works! I haven't managed to beat sager's time, nor am I that motivated to do so. It maybe possible to get faster times if people exploit EPG wall boosting and frag splash damage boosting. 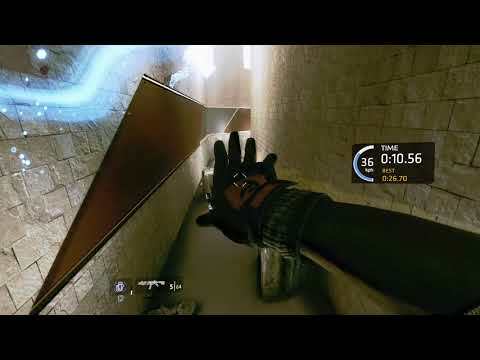 Also, trying to maximize wall jumps between walls would increase speed. So I can see potential areas that could be exploited for faster times, but unfortunately don't have the dexterity or super reflexes to get the jump timing perfect so I don't wall run forward and lose speed. The jump timing is actually really annoying. Sometimes, you get it just right and reach 50 kph no prob, sometimes, it takes a couple of jumps to do it, and sometimes you just freaking stick to the wall like spiderman. I find the most consistent timing to be just as the arm starts to move towards the wall. Slide hopping is easier, but if you really don't want to loss any speed, the timing has to be just as perfect. Oh well. It feels all the better when you get it down. Thanks @OdysseusVA! To get a jump kick you have to jump before the hand touches the wall, its an incredibly short time, and I am really too incosistent to do it. Now that you have beaten Gamesager's time, beat AnAngryAlbino's of 16 seconds. 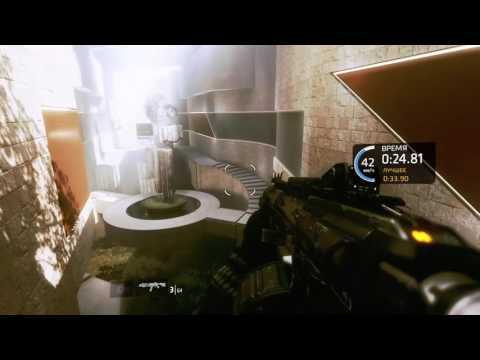 (without grunt kills, once he finished it turned to like 54 seconds) then, beat his singleplayer speedrun time. On a serious note, I don't get why you want to grind improvement for a thing in a video game which means literally nothing. To each his own, I guess. @krabanyash_ Yeah, I may have dropped some choice expletives as well, fair enough! Finally, it wasn't so much improving in the gauntlet as it was improving on the consistency of my wall and slide hops in multiplayer. Like, yeah, I can do them, but do them every time? Nah. But I am getting there. Slowly. One of the problems is that I can't play as much multiplayer as I'd like (Our internet makes dial up seem appealing, so I gotta do it elsewhere. Walmart parking lot isn't out of the question !). Like, if I'd played as much as I'd have liked too, I'd probably be gen 15-20. I'm gen 2.25 or something. Oh well.